Open data is the idea that some data should be freely available to everyone to use and republish as they wish, without restrictions from copyright, patents or other mechanisms of control. The goals of the open-source data movement are similar to those of other "open(-source)" movements such as open-source software, hardware, open content, open education, open educational resources, open government, open knowledge, open access, open science, and the open web. Paradoxically, the growth of the open data movement is paralleled by a rise in intellectual property rights. The philosophy behind open data has been long established, but the term "open data" itself is recent, gaining popularity with the rise of the Internet and World Wide Web and, especially, with the launch of open-data government initiatives such as Data.gov, Data.gov.uk and Data.gov.in. freedb is a database of compact disc track listings, where all the content is under the GNU General Public License. To look up CD information over the Internet, a client program calculates a hash function from the CD table of contents and uses it as a disc ID to query the database. If the disc is in the database, the client is able to retrieve and display the artist, album title, track list and some additional information. CDDB, short for Compact Disc Database, is a database for software applications to look up audio CD information over the Internet. This is performed by a client which calculates a (nearly) unique disc ID and then queries the database. As a result, the client is able to display the artist name, CD title, track list and some additional information. CDDB is a licensed trademark of Gracenote, Inc.
MusicBrainz captures information about artists, their recorded works, and the relationships between them. Recorded works entries capture at a minimum the album title, track titles, and the length of each track. These entries are maintained by volunteer editors who follow community written style guidelines. Recorded works can also store information about the release date and country, the CD ID, cover art, acoustic fingerprint, free-form annotation text and other metadata. As of 21 September 2018 [update] , MusicBrainz contained information about roughly 1.4 million artists, 2 million releases, and 19 million recordings. End-users can use software that communicates with MusicBrainz to add metadata tags to their digital media files, such as FLAC, MP3, Ogg Vorbis or AAC. Cover art is a type of artwork presented as an illustration or photograph on the outside of a published product such as a book, magazine, newspaper (tabloid), comic book, video game, DVD, CD, videotape, or music album. The art has a primarily commercial function, for instance to promote the product it is displayed on, but can also have an aesthetic function, and may be artistically connected to the product, such as with art by the creator of the product. An acoustic fingerprint is a condensed digital summary, a fingerprint, deterministically generated from an audio signal, that can be used to identify an audio sample or quickly locate similar items in an audio database. FLAC is an audio coding format for lossless compression of digital audio, and is also the name of the free software project producing the FLAC tools, the reference software package that includes a codec implementation. Digital audio compressed by FLAC's algorithm can typically be reduced to between 50 and 70 percent of its original size and decompress to an identical copy of the original audio data. 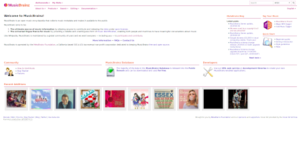 MusicBrainz allows contributors to upload cover art images of releases to the database; these images are hosted by Cover Art Archive (CAA), a joint project between Internet Archive and MusicBrainz started in 2012. Internet Archive provides the bandwidth, storage and legal protection for hosting the images, while MusicBrainz stores metadata and provides public access through the web and via an API for third parties to use. As with other contributions, the MusicBrainz community is in charge of maintaining and reviewing the data. Cover art is also provided for items on sale at Amazon.com and some other online resources, but CAA is now preferred because it gives the community more control and flexibility for managing the images. The Internet Archive is a San Francisco–based nonprofit digital library with the stated mission of "universal access to all knowledge." It provides free public access to collections of digitized materials, including websites, software applications/games, music, movies/videos, moving images, and nearly three million public-domain books. As of October 2016, its collection topped 15 petabytes. In addition to its archiving function, the Archive is an activist organization, advocating for a free and open Internet. In computer programming, an application programming interface (API) is a set of subroutine definitions, communication protocols, and tools for building software. In general terms, it is a set of clearly defined methods of communication among various components. A good API makes it easier to develop a computer program by providing all the building blocks, which are then put together by the programmer. MusicBrainz Picard is a free and open-source software application for identifying, tagging, and organising digital audio recordings. It was developed by the MetaBrainz Foundation, a non-profit company that also operates the MusicBrainz database. In 2000, MusicBrainz started using Relatable's patented TRM (a recursive acronym for TRM Recognizes Music) for acoustic fingerprint matching. This feature attracted many users and allowed the database to grow quickly. However, by 2005 TRM was showing scalability issues as the number of tracks in the database had reached into the millions. This issue was resolved in May 2006 when MusicBrainz partnered with MusicIP (now AmpliFIND), replacing TRM with MusicDNS. TRMs were phased out and replaced by MusicDNS in November 2008. A recursive acronym is an acronym that refers to itself. The term was first used in print in 1979 in Douglas Hofstadter's book Gödel, Escher, Bach: An Eternal Golden Braid, in which Hofstadter invents the acronym GOD, meaning "GOD Over Djinn", to help explain infinite series, and describes it as a recursive acronym. Other references followed, however the concept was used as early as 1968 in John Brunner's science fiction novel Stand on Zanzibar. In the story, the acronym EPT later morphed into "Eptification for Particular Task". AmpliFIND is an acoustic fingerprinting service and a software development kit developed by the US company MusicIP. In October 2009 MusicIP was acquired by AmpliFIND. Some time after the acquisition, the MusicDNS service began having intermittent problems. Since the future of the free identification service was uncertain, a replacement for it was sought. The Chromaprint acoustic fingerprinting algorithm, the basis for AcoustID identification service, was started in February 2010 by a long-time MusicBrainz contributor Lukáš Lalinský. While AcoustID and Chromaprint are not officially MusicBrainz projects, they are closely tied with each other and both are open source. Chromaprint works by analyzing the first two minutes of a track, detecting the strength in each of 12 pitch classes, storing these 8 times per second. Additional post-processing is then applied to compress this fingerprint while retaining patterns. The AcoustID search server then searches from the database of fingerprints by similarity and returns the AcoustID identifier along with MusicBrainz recording identifiers if known. A CD ripper, CD grabber, or CD extractor is software that converts tracks on a Compact Disc to standard computer sound files, such as WAV, MP3, or Ogg Vorbis. ID3 is a metadata container most often used in conjunction with the MP3 audio file format. It allows information such as the title, artist, album, track number, and other information about the file to be stored in the file itself. Discogs is a website and crowdsourced database of information about audio recordings, including commercial releases, promotional releases, and bootleg or off-label releases. The Discogs servers, currently hosted under the domain name discogs.com, are owned by Zink Media, Inc., and are located in Portland, Oregon, US. While the site lists releases in all genres and on all formats, it is especially known as the largest online database of electronic music releases, and of releases on vinyl media. Discogs currently contains over 10.6 million releases, by over 5.3 million artists, across over 1.1 million labels, contributed from over 443,000 contributor user accounts — with these figures constantly growing as users continually add previously unlisted releases to the site over time. An APE tag is a tag used to add metadata, such as the title, artist, or track number, to digital audio files. AMG LASSO is a media recognition service launched by the All Media Guide in 2004. The LASSO service automatically recognizes CDs, DVDs, and digital audio files in formats such as MP3, WMA, and others. The service uses CD table of contents (ToC), DVD ToC, and acoustic fingerprint based recognition to recognize media. LASSO is available in versions for PCs and embedded devices. A cue sheet, or cue file, is a metadata file which describes how the tracks of a CD or DVD are laid out. Cue sheets are stored as plain text files and commonly have a ".cue" filename extension. CDRWIN first introduced cue sheets, which are now supported by many optical disc authoring applications and media players. A tag editor is a piece of software that supports editing metadata of multimedia file formats, rather than the actual file content. These are mainly taggers for common audio tagging formats like ID3, APE, and Vorbis comments, but can also be taggers for JPEG, PDF and TIFF metadata. Jaikoz is a Java program used for editing and mass tagging music file tags. Gracenote, Inc. provides music, video and sports metadata and automatic content recognition (ACR) technologies to entertainment services and companies, worldwide. Gracenote's music recognition technologies compare digital music files to a worldwide database of music information, enabling digital audio devices to identify songs. The company licenses its technologies to developers of consumer electronics devices and online media players, who integrate the technologies into media players, home and car stereos, and digital music devices. The company operates five businesses: Music, Video, Sports, Automotive and Video Personalization. Headquartered in Emeryville, California, the company employs approximately 1,700 people in 20 offices around the world. Gracenote is now a Nielsen company. Mp3tag is a freeware metadata editor for many audio file formats for Microsoft Windows. An audio search engine is a web-based search engine which crawls the web for audio content. The information can consist of web pages, images, audio files, or another type of document. Various techniques exist for research on these engines. Puddletag is an audio tag (metadata) editor for audio file formats. AcoustID is a webservice based on the Chromaprint acoustic fingerprint algorithm. It can identify entire songs but not short snippets. Kid3 is an open-source cross-platform audio tag editor for many audio file formats. It supports DSF, MP3, Ogg, FLAC, MPC, MPEG-4 (mp4/m4a/m4b), AAC, Opus, SPX, TrueAudio, APE, WavPack, WMA, WAV, AIFF, tracker modules. ↑ "About". MusicBrainz. MetaBrainz. Archived from the original on 2015-05-08. Retrieved 4 May 2015. ↑ "Musicbrainz.org Traffic, Demographics and Competitors - Alexa". www.alexa.com. Retrieved 4 February 2019. 1 2 "Database Statistics". MusicBrainz. Archived from the original on 2011-07-22. Retrieved 2018-09-20. ↑ "WHOIS Lookup". ICANN. Archived from the original on 2015-04-02. Retrieved 23 March 2015. ↑ Highfield, Ashley. "Keynote speech given at IEA Future Of Broadcasting Conference Archived 2008-04-22 at the Wayback Machine ", BBC Press Office, 2007-06-27. Retrieved on 2008-02-11. ↑ Swartz, A. (2002). "MusicBrainz: A semantic Web service" (PDF). IEEE Intelligent Systems. 17: 76–77. doi:10.1109/5254.988466. Archived (PDF) from the original on 2015-04-03. Retrieved 2015-08-28. ↑ "New fingerprinting technology available now!" (Press release). MusicBrainz community blog. 2006-03-12. Archived from the original on 2008-08-07. Retrieved 2006-08-03. ↑ "Introducing Chromaprint – Lukáš Lalinský". Oxygene.sk. 2010-07-24. Archived from the original on 2018-10-10. Retrieved 2018-04-10. ↑ Jang, Dalwon; Yoo, Chang D; Lee, Sunil; Kim, Sungwoong; Kalker, Ton (2011-01-18). "How does Chromaprint work? – Lukáš Lalinský". IEEE Transactions on Information Forensics and Security. 4 (4): 995–1004. doi:10.1109/TIFS.2009.2034452 . Retrieved 2018-04-10. ↑ Kaye, Robert (2006-03-12). "The MetaBrainz Foundation launches!" (Press release). MusicBrainz community blog. Archived from the original on 2011-05-19. Retrieved 2006-08-03. ↑ Kaye, Robert (2006-01-20). "Introducing: Linkara Musica". MusicBrainz. Archived from the original on 2008-09-07. Retrieved 2006-08-12. ↑ Kaye, Robert (2007-06-28). "The BBC partners with MusicBrainz for Music Metadata". MusicBrainz. Archived from the original on 2007-06-30. Retrieved 2007-07-10. ↑ Shorter, Matthew (2008-07-28). "BBC Music Artist Pages Beta". BBC. Archived from the original on 2009-01-24. Retrieved 2009-02-12. Wikimedia Commons has media related to MusicBrainz .